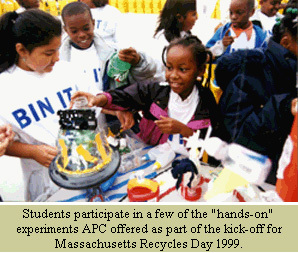 As the winner of the school prize for Massachusetts Recycles Day 1998 and to serve as 1999's kick-off event, the Laurel Lakes School of Fall River, MA was awarded a brand new playground made from 75% recycled plastics (more than 1.5 tons of recycled consumer milk jugs)! In order to compete for this playground, students, teachers and parents from school systems and communities throughout the state had to make formal pledges to recycle more as well as buy more recycled products. In accepting the playground, comprised of a variety of entertaining, fitness and other functioning equipment, Principal Edward Foley of the Laurel Lakes School stated, "Everyone in our school system - our students, their teachers - and even the parents of the children who attend Laurel Lakes worked extremely hard to win this state-wide competition. It required a total effort by volunteers in our community to gather pledges and recycle more and buy more recycled products. The promise of a brand new playground for the winning school, plus a greater awareness by the school generation of the need to recycle were the driving forces. We're proud of this accomplishment." "There is a misconception that recycled content products are difficult to find," said David Hendrickson, Coordinator for Massachusetts Recycles Day. "The recycled plastic playground by the American Plastics Council is the perfect showcase for the types of top-of-the-line products being manufactured from the recyclables we place at our curbside or drop-off at the recycling center." Plastic bottles such as these are used to make the recycled playground the students at Laurel Lakes School are now enjoying. The playground is both esthetically and environmentally "pleasing" since the equipment will need virtually no maintenance due to recycled plastic lumber's resistance to weather variables. Additionally, the colors on the equipment are part of the material itself and will never require touch-up painting, helping to keep maintenance relatively simple. Use of this plastic lumber also means that children will never encounter splinters. In order to promote recycling, the benefits of recycled plastic lumber and other Massachusetts Recycles Day activities, APC partnered with MassRecycles, Inc, the state recycling organization, the U.S. Environmental Protection Agency (EPA) and other non-profit associations in the State. APC also had a number of products made with recycled plastic on display, including office supplies, backpacks, fanny packs, fleecewear, and garden and landscape items. The American Plastics Council publishes the Recycled Plastic Products Source Book, a guide for procurement and business officials containing over 1400 recycled plastic products. APC's also has a free pocket-sized consumer's booklet entitled Shop Recycled! which contains over 240 products available in grocery and retail outlets around the country. Both guides can be ordered through APC's website.